Our Heavy Gauge Scottish One Pint Pewter Tankard measures 5.11 inches tall by 3.14 inches wide. 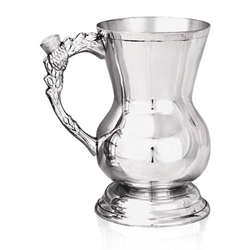 Designed to help the recipient embrace their Scottish heritage, this gorgeous tankard has an elegant Georgian style body with a quirky Scottish thistle handle to give a really striking overall effect. The highly polished, mirror-like finish is perfect for the engraving of a name, date or personal message.